As a small side project, I recently built a binary clock as a gift for a friend. 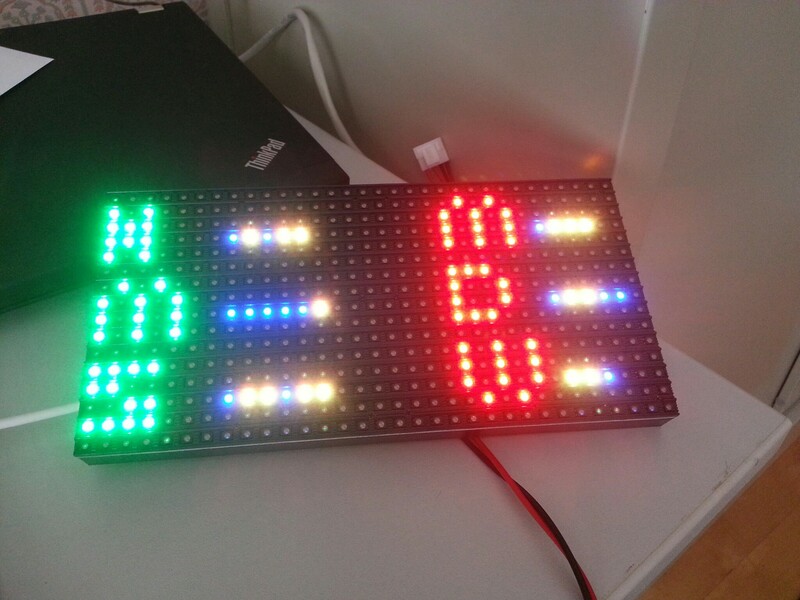 Nothing says “I care” more than a homemade LED binary clock. This tutorial will walk you through the motions of setting up both the hardware and software you’ll need to duplicate it, as well as provide you with the tools you need to extend the code I show to display anything you want on the LED display. A Raspberry Pi. Get it anywhere Pi’s are sold! A hardware clock to keep track of time across reboots without internet access. I got mine from AB Electronics, and the tutorial is tailored to that specific clock module. An LED array to use as a display. I ordered mine from Adafruit and have also tailored the tutorial to match that. A 5V power supply. You can get this in a hardware store for around 15€. A micro-USB power supply for the Raspberry Pi, of course. A soldering iron to wire up your fancy new device. 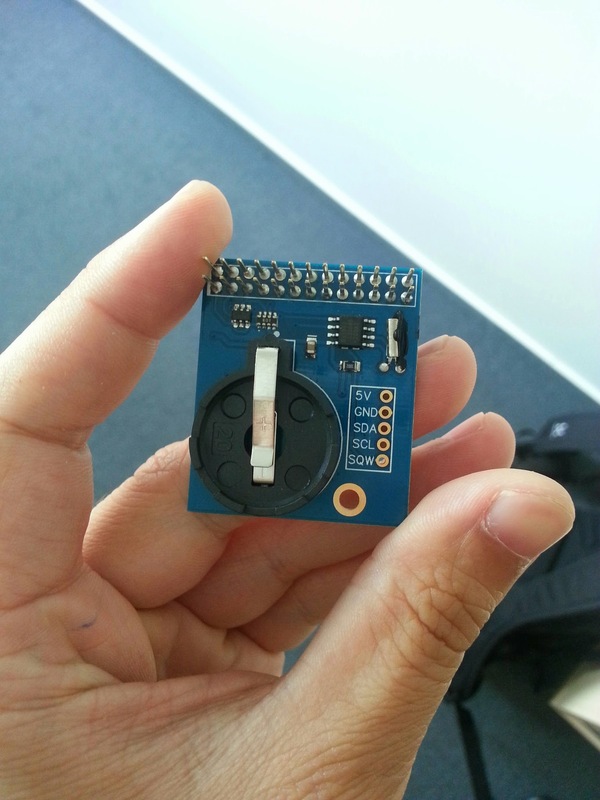 A CR2032 button battery to power the hardware clock. Additionally, the tutorial works with the software in my BinaryClock repository. The code is easy to extend to do things above and beyond what I’ve implemented here, if you’re interested. The Raspberry Pi doesn’t use a hardware clock, so every time you power it down the time is reset. Normally this isn’t a problem because if you have an internet connection, the Pi will update the clock using an NTP server. If this isn’t the case, the time will be incorrect. I wanted the clock to be able to report time accurately without internet access, for example in an office with no WiFi, so an extra hardware clock was necessary. Connecting the clock module I recommended to the Raspberry Pi isn’t hard – you just slide it down over the GPIO pins so that the clock is hanging over the body of the Pi. The main reason I chose this clock is because it extends the GPIO pins rather than blocking them. If you’re working with another hardware clock, you’ll need to ensure that you can still access the GPIO pins after attaching it. Otherwise you won’t be able to control your LED matrix. 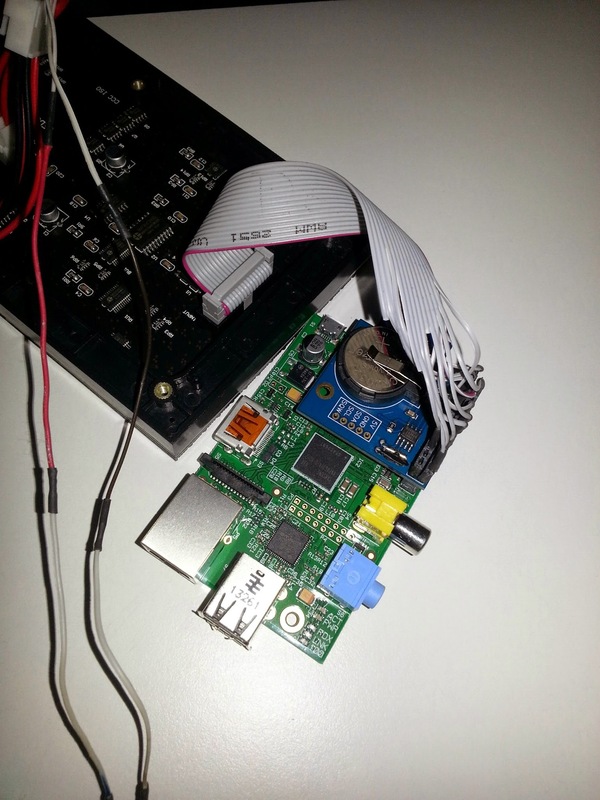 The folks at AB Electronics have a nice tutorial on setting up their hardware clock with a Raspberry Pi. If you’re feeling lazy, you don’t have to follow it yourself – the Makefile in BinaryClock will take care of it for you when you install the clock. If I had written it really elegantly, configuring the clock would a separate target that wouldn’t be executed automatically on install, but as it is, it’s a dependency of the install target, so if you install my clock program you’ll have the hardware clock set up automatically. # Now reboot and you're done! For further details, see the tutorial linked above. Wiring plan connecting the Raspberry Pi pins to the LED display. The GPIO pins on the Raspberry Pi are shown on the left in the positions they’d have if you were holding the Pi with the pins on the top right. They are connected to the LED array’s input pins. Source: Adafruit. You’ll need to connect the LED array’s pins to the pins sticking up from the real time clock and not to those of the Raspberry Pi, if you’re wanting to use the real time clock to track time. I ended up cutting up one of the connectors provided with the LED array, stripping the wires, and soldering them to a connector piece that I placed on top of the real time clock’s pins. This limited the number of useless dangling wires. The Raspberry Pi connected to the LED array. Once that’s done, you need to provide the LED array with power. Adafruit suggests using a screw jack adapter. The power supply, connected to the LED array via a screw jack adapter. After you’ve completed these two steps, your hardware is ready so you can get to work on the software! You’ll see the clock interpreting the time in binary. If you’re happy with your binary clock, you can stop reading. If you’re interested in understanding how it’s implemented or how to do it yourself, read on! In the BinaryClock repository you’ll find a subfolder named “external”, which contains another subfolder, “rpi-rgb-led-matrix”. This folder is a submodule containing code by Henner Zeller. The Makefile in BinaryClock compiles it by using the Makefile in this submodule, and aside from compiling the individual objects, this also compiles an example program called “led-matrix”. You can run it to see different examples of what you can do with the LED matrix, and you can also use it to gather examples of how to write your own classes for interacting with the display. 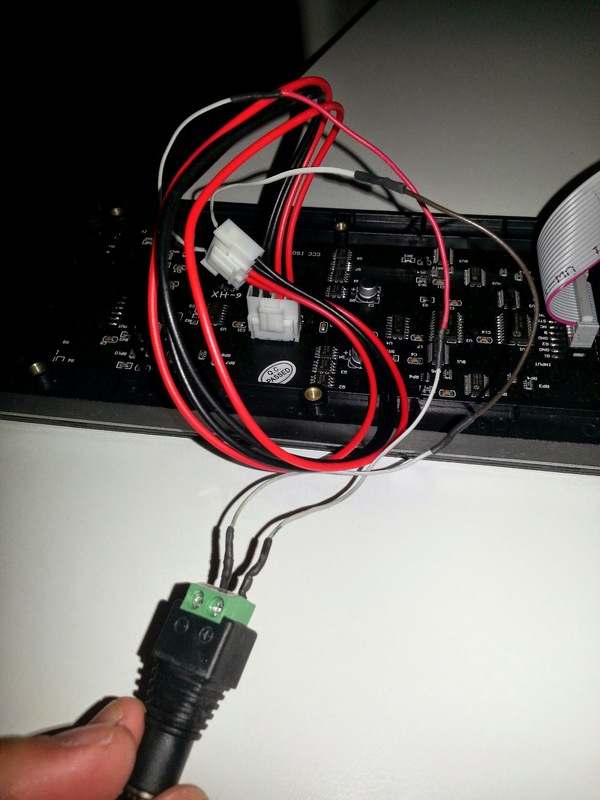 Because it requires accessing the GPIO pins, it must be run with sudo rights. The library offers a few utilities: The RGBMatrix class, which basically symbolizes the board itself and allows you to set the colors of individual pixels. It also contains the classes RGBMatrixManipulator and DisplayUpdater, which make sure that the display can be updated continuously in a separate thread, allowing the display to be animated without halting the program that controls it. All of these classes make use of the Thread and GPIO classes. The most important one is GPIO, because you have to initialize it manually in order to use the GPIO pins to interact with your LEDs. This is a lot of bookkeeping and I would have liked to move all of that into a class that abstracts away these details, but in the end I was only able to do that with partial success because it got a bit complicated with dangling pointers. Also, note that this is a reduced example from main.cc – starting an RGBMatrixManipulator all by itself doesn’t do much. In the actual example subclasses implement the Start method, but the base classes don’t. I didn’t include such an example for the sake of brevity. * A clock that reports time in binary. A glance in clock.cpp will show you the implementation. At its heart it contains an update_time method which creates a time_t object which is passed to a tm object using the localtime function in time.h in order to get the current local time. Then the tm object is queried in order to set the year, month, day, hour, minute, second, and day_of_week properties. Each time one of the getters is called, it updates the object’s time, creates a std::bitset object which is the binary representation of the integer for the property in question, and converts the bitset into a string. The string is returned to the caller. * A binary clock that reports the time tracked by a BinaryDate. The string is formated to match the dimensions of the LED array and is used by the following classes to control what’s displayed there. I like producing strings and parsing them to control the LEDs rather than controlling the LEDs directly – this gives me more control and also opens up the possibility of displaying the content in other media. For example, having the BinaryClock class return a string rather than accessing the LEDs directly had the advantage that I could play around with the class on the command line on my laptop before pushing the code to the Raspberry Pi to test it live with the LED array. * An abstract reporter that parses a string and passes it to an LED array. * is set in the LED array using set_color. * happens, but I'm leaving it there so that I always clear the screen on exit. Pretty simple. All it does is check that the StringReporter is still running. If it is, it calls the object’s get_string method, sets the x and y coordinates referring to individual LEDs in the array to 0, and then iterates over the chars in the string. Each char is passed to the object’s set_color method, which has the job of reacting to it appropriately. I have proposed moving the StringReporter into the rpi-rgb-led-matrix library, since it implements a rather abstract functionality that other users might be interested in. We’ll see what Henner thinks about the idea. * A concrete StringReporter that reports the time as formated by BinaryClock. No surprises here. get_string only calls the BinaryClock’s report_time method, while set_color examines each char it receives from Run and reacts appropriately. First, it examines the char and generates a color from it. If it doesn’t know the char it finds, it sets the color to black. If it finds a carriage return, it does a carriage return along the LED array coordinates. Finally, it sets the color of the given pixel at its current coordinates before incrementing the X-coordinate. * An interface between a BinaryClockReporter and the LED array. * BinaryClockReporter and the DisplayUpdater. The DisplayUpdater and BinaryClockReporter are started, creating a separate thread that updates the clock continually. * Initialize GPIO pins and RGB matrix, then create and run LedClock. If you want to extend the library on your own, all you need to do is implement a StringReporter that produces an appropriate string and interprets the symbols found in it while iterating correctly through the X and Y coordinates. Another thing that might be useful would be to change the LedClock class to not be so clock-specific. It would need a different name, like LedDisplay, and would have to use a StringReporter pointer rather than a BinaryClockReporter for its reporter property. Otherwise it could stay the same. This would allow other users to reuse this logical encapsulation, so that their code would be as simple as in the main function. In this case, however, it would also be a good idea to remove the call to getchar from the run method, so that control of the program would remain in the hands of the developer who implements the main function.